Phantoms in T1! At the Cranberry Trifest Sprint Triathlon in Lakeville, MA. Most people think a triathlon is en event comprised of three disciplines: swimming, cycling, and running. But experienced triathletes know the all-important FOURTH discipline: The Transition. 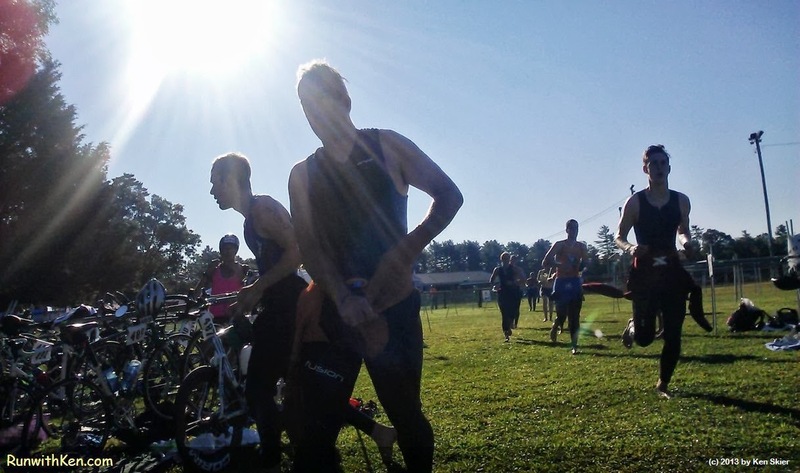 Here's a photo I took during the first transition ("T1") at the Sun Multisport Events﻿ Cranberry Sprint Triathlon. The athletes look like phantoms as they flit through the green and blue, clad in their black wetsuits. I call this photo, "Phantoms in T1." Hope you enjoy it! By the way...you can't see their faces. They're just shadows. Other-worldly souls flitting through T1 as we sprint to our own transition spots and struggle into our socks and cycling shoes. That's why I call it "Phantoms in T1."